NAILS’ Next Top Nail Artist: Could It Be One Of Your Recent Graduates? NAILS Magazine, the parent brand to Nail School News, wants to identify the next crop of up-and-coming nail artists in an online reality-show inspired contest. Does one of your recent nail program graduates fit the bill? NAILS Magazine, the parent brand to Nail School News, wants to identify the next crop of up-and-coming nail artists in an online reality-show inspired contest. The inaugural NAILS’ Next Top Nail Artist is searching for licensed nail techs of all experience levels who have that “it” factor. Does one of your recent nail program graduates fit the bill? Let your recent graduates who have passed their state board exams know about this great opportunity. It could give them an amazing kickstart to grow their careers — and bring acclaim to your school. The final two contestants will receive FREE admission to ISSE Long Beach 2014, a two-night hotel stay in Long Beach, Calif., to attend the finale, airfare (up to $500) to Long Beach, $1,000 cash prize, enough nail art supplies to keep the winner creating for some time, the opportunity to work for a major manufacturer, and a spot on the NAILS blogroll for one year. 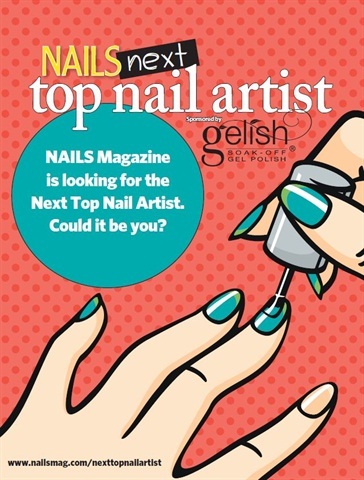 To enter, simply fill out the online application at www.nailsmag.com/nextopnailartist to later than April 27. We can’t wait to see what your graduates come up with!